Gonville & Caius (pronounce ‘Keys’ or you will get your ears boxed by a Caian – ‘Key-an’) is one of the oldest colleges in Cambridge, and has a dynamic and thriving graduate community of around 280 students from all across the world. Some are Cambridge undergrads who’ve stayed on for postgraduate degrees, but many are overseas or non-UK students who choose to complete MPhils or PhDs at Cambridge. While faculties and departments provide a variety of opportunities for engaging with the academic community at the University, the Middle Combination Room (MCR) provides an immediate and vibrant network of like-minded graduate students. It gives you the traditional Cambridge experience, while also being friendly and supportive. Originally founded in 1348 as Gonville Hall, Caius has a strong academic reputation, boasting 14 Nobel Laureates (including Francis Crick, of DNA fame); current graduates recently had the pleasure of dining with Stephen Hawking, a Fellow of Caius, during one of the termly occasions when fellows dine with graduates. Inseparably linked to its academic excellence, however, is a thriving, socially active graduate community, comprising around 280 students from both scientific and arts backgrounds. 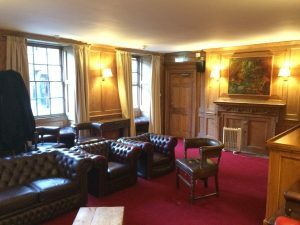 We have our own Common Room (the wooden-panelled ‘MCR’ in Caius Court, adjacent to the Red Room/College Bar, which also contains the ‘pidges’ or pigeon holes for mail), as well as our own Graduate Tutors for welfare purposes or academic advice and a committee parallel to the undergraduate student union, the GCSU. Graduates dine in college more frequently at Caius than at other Cambridge colleges. This, combined with our small size, means we have a very friendly, close-knit atmosphere where most graduates know – or at least know of each other. The MCR Committee, elected annually every February, is responsible for planning and running a wide array of academic (such as the fortnightly ‘MCR-SCR Talks’ with Fellows at College, where one graduate and one fellow present a short paper on their subject of expertise) and social (Superhalls, sporting events, coffee & tea afternoons) events year-round. The MCR committee also holds Port Night every Thursday during Term, to which all Caius graduates are invited for free port following dinner. One need not dine in hall to join the festivities: all members of the MCR members are warmly invited to drop by the Old Courts MCR anytime after 8.30PM. Because even the busiest grads find a way to make it in for free port, Port Night is an excellent way to maintain contact with the MCR community as whole during the course of term-time. If you want to know more about the current committee, and positions that you can apply for, check out our Committee page. If you can’t find what you’re looking for, or would like to seek clarification or advice on any matter, please contact the Admissions Office. Alternatively, please feel free to contact either the MCR President or Vice-President at (see MCR Committee section for e-addresses), respectively, with any questions. Caius – Who are we?